Clear Lake High School students won first place in Texas in the Real World Design Challenge. 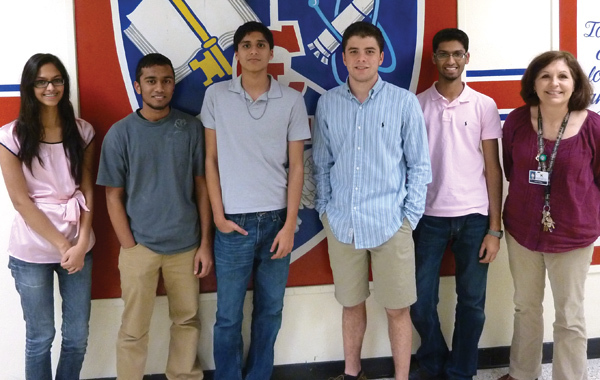 They are, from left, senior Aalisha Maknojia and juniors Amar Harris, Jayant Leal, Mason Kepp and Junaid Maknojia. Their teacher is Lillian Wilson. Clear Lake High School students won first place in Texas in the Real World Design Challenge. They are senior Aalisha Maknojia and juniors Amar Harris, Jayant Leal, Mason Kepp and Junaid Maknojia. Their teacher is Lillian Wilson. The RWDC is a project-based annual high school competition run by a public-private partnership with the goal of sustainably increasing the Science, Technology, Engineering, and Mathematics (STEM) workforce. RWDC provides students with the opportunity to apply the lessons of the classroom to the technical problems that are being faced in the workplace. Partners include NASA, the Department of Defense, the National Governors Association, and numerous university and industry partners. Two industry partners, PTC and Mentor Graphics provide up to $1 million worth of professional software and training to each team that competes, and employees of the partners serve as team mentors and judges. RWDC is free to compete, and challenges teams with real design problems, using professional engineering tools, with team members playing real roles. This year’s challenge was to design a Small Unmanned Aircraft Systems, which includes one or more aircraft and control station, and to develop a business plan in support of commercial applications based on the following mission scenario. Teams had to design an aircraft system to search for a missing, injured and immobilized child with a blue jacket in a designated 2-mile radius circular search area. The team then refined the vehicle design, sensor payload selection, search pattern, best altitudes for the selected sensor payload, and associated ground equipment to find the child in the minimum time while also minimizing cost. The final product was an engineering notebook including the business plan. Representing Texas, the Clear Lake High School team now heads to the national championship in Washington DC in April. The challenge for the national competition is to refine their initial design to find the child in the minimum time while also minimizing cost. The National Challenge requires a comprehensive re-evaluation of the design process. They will present their final designs and business plan to a panel of industry experts.